Support newborn screening for SCID by GIVING A GIFT and DONATING TODAY. 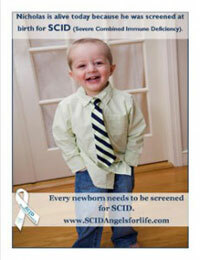 SCID, Angels for Life Foundation is a not for profit public charity and donations are 100% tax deductible. We’ve reached our goal of universal newborn screening for SCID in the United States! It’s a journey that took us ten years to complete, but on December 10, 2018, the 50th state began screening for SCID…what an accomplishment!!! Our need to support the families diagnosed with SCID has now grown significantly. Please help us honor all of our requests by supporting our SCID Family Scholarship Program. Your donation, no matter how big or small, is greatly appreciated. Our two children,^Brandon^ and Taylor, have both been affected by X-Linked SCID, Severe Combined Immune Deficiency, better known as “The Bubble Boy Disease.” Brandon’s battle began in November of 1993 when he came down with his first cold. He was 6 months old at the time, and appeared to be a “normal” baby without any infections, until we quickly learned that he did not respond to a cold like a “normal” baby would. He was admitted to the hospital when he showed failure to thrive. He had a difficult time eating, a rash on his face, thrush in his mouth, and his finger nails had turned blue. ^Brandon^ did not respond to treatment and was quickly transferred from hospital to hospital, while the doctors battled for answers and some kind of a diagnosis. Finally, after being in the hospital for 3 weeks the doctors came up with a “preliminary” diagnosis, SCID, better known as “The Bubble Boy Disease.” I had seen the movie with John Travolta, but I never dreamed I would someday lose my first born child to this devastating disease. At this point ^Brandon^ was on ECMO, a heart/lung bypass machine, suffered from Graft vs Host Disease, which he developed from the 13 blood transfusions he had received during his hospitalization. Well over $250,000 was spent on his 3 1/2 week hospitalization and that does not include any treatment, such as a Bone Marrow Transplant. In fact, at this point the idea of a bone marrow transplant, the only cure for children with X-SCID, wasn’t even an option presented to us for consideration. Instead, we were told that we had to say good bye to our only child and turn off all machines. Three and a half weeks after initially becoming ill, our precious ^Brandon^ passed away and became our SCID Angel For Life. On December 14, 1993 he earned his ^^ wings. Thankfully, Taylor’s story is VERY different from ^Brandon’s^. Since we now know I am a carrier of SCID, the odds for each pregnancy of having another SCID child is 1 in 4. Because of the risk of having another affected child we opted to have a CVS (chorionic villi sampling) test done as early as possible during our next pregnancy. This was done at 10 weeks at Hutzel Hospital in Detroit, MI. The next day we were notified that the baby I was carrying was a boy. Suddenly our odds of having another SCID baby went from 1 in 4 to 1 in 2. Either he would be healthy or he would be born with SCID. We had already done quite a bit of research on SCID after we lost ^Brandon^ and we knew that a BMT (bone marrow transplant) was our only option to treat, and possibly cure, our new baby boy. However, what we didn’t know was that the bone marrow transplant could actually be done in-utero, while I was still pregnant! And if that wasn’t amazing enough news the transplant could actually be done in Detroit, just two hours away from our home. The only catch to this story was that the procedure had never actually been done successfully on a fetus before. Our physician, Dr. Alan Flake, had been doing research in the lab on sheep and was waiting for the “perfect patient.” That would be us! 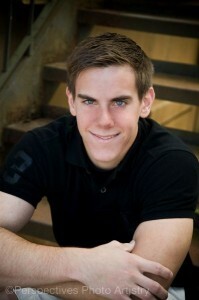 At 16, 17.5 & 18.5 weeks gestation three separate stem cell transplants were performed with his father being the donor. The neat thing about this procedure is that you don’t need a perfect matched donor, a half matched parent works just fine. Also, because you’re doing the procedure before the fetus has developed it’s own immune system, the risk of GvHD (graft vs host disease – where the body rejects the donor marrow, attacks it and reacts to it like it is foreign) is substantially less. You also are not subject to being put in reverse isolation like you would be with a traditional BMT. The womb is the ideal isolation bubble for the remainder of the pregnancy. Because of all of the above mentioned reasons, we decided to go ahead with this “experimental procedure” and if it didn’t work, our plan B was to do a traditional BMT within the first three months of life. At 36 weeks Taylor was born via C-section weighing 4 pounds 3 ounces and was 17 3/4 inches long. The cord blood was immediately tested at birth and the preliminary results were extremely positive. It looked like the transplant was a success. Taylor remained in the hospital for three weeks before he was released to go home. At home we remained in reverse isolation for several months until we got the call from Dr. Flake on November 21, 1995 stating that Taylor’s treatment was a success and he could gradually be introduced to the outside world. That meant we could leave the house with him and take him to the park, out to dinner, to the mall and finally over to visit his relatives. Years later, Taylor is a thriving, healthy young man who’s graduated High School and is now in college! Looking back on his life I have to say it really has been an incredible journey for us. Taylor’s only medication is an infusion of Gamma Globulin every three weeks, better known as IVIG. IVIG is a blood product that provides people with weakened immune systems the antibodies they are missing to keep them healthy and fight off infections. Compared to most SCID kids, Taylor has really had an “easy” time of it and for that, we thank GOD and our lucky stars! We have no idea what the future holds for Taylor but everyday we spend with him is a true blessing!